It’s a Wee Wander finish for me today! Wee Wander is such a pretty line of fabric – I bought both colour ways but tackled the pink first. Scarlett of course helped out on whenever she could. I went with some loop the loop quilting to kind of suggest the firefly flight paths (and the birds, and the falling blossoms) and did S’s in the darker blocks, as the recipient’s name starts with an S.
I used O-Sew-Soft poly wadding and feathered the sides fairly heavily, to practice my feathers. And here is the finished quilt! Say hello to some other party goers. We all love comments! What an absolutely sweet finish! I love that Wee Wander… and what you have done with it. The quilting is perfect! Love the feathers and those S’s. 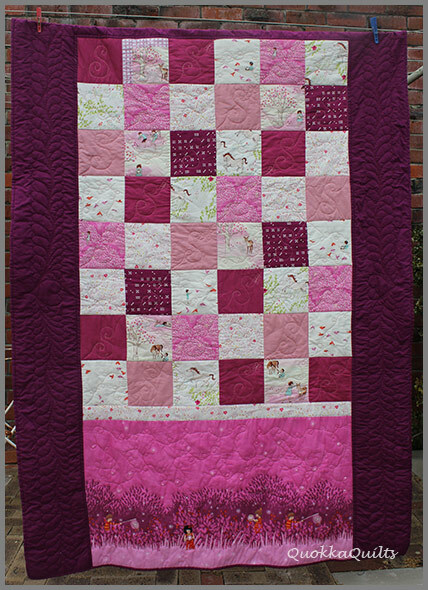 I was happy to see this quilty finish today! It’s fun to see how you used the bottom panel — it’s just not something I’ve considered before. Your thick raspberry borders remind me of the quilt that’s on my sewing table now, which has thick red borders. I’ve been hesitant to start the quilting — I’m convinced I’m not going to like it! — but seeing how your quilted borders work compels me to dive in. Thanks! I really need to get some Wee Wander. 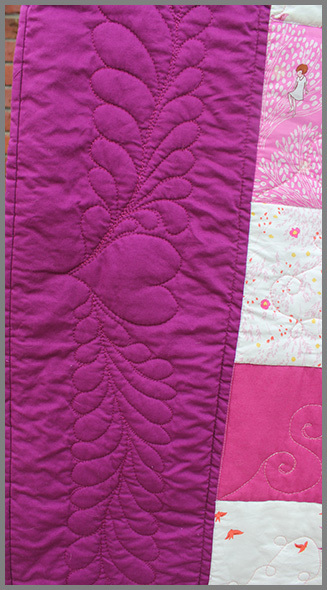 I love the quilting you did on this–so much fun! Wow! your fabric is amazing. 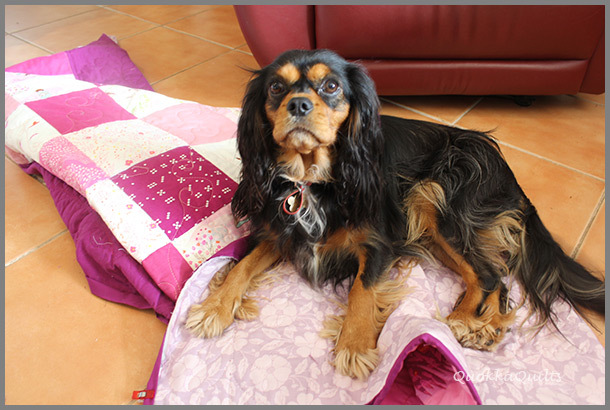 Love your quilt. Beautiful quilting. I really wish I had purchased some of this fabric line! I love that fabric line too! The solids you chose go fabulous with those prints! 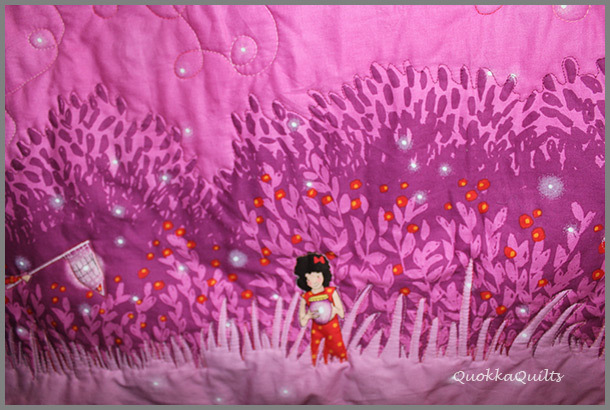 I love the quilting you have done on this, it has a whimsical feel about it which really fits with the fabric. What a beautiful quilt! 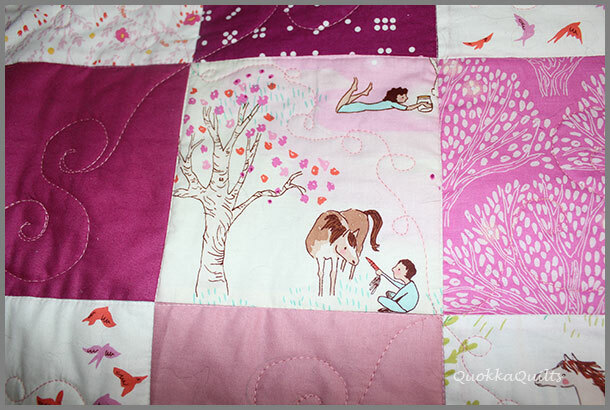 I love your quilting and how you can see how lovely the Wee Wander line is with your layout. Adorable! Love your feathers. 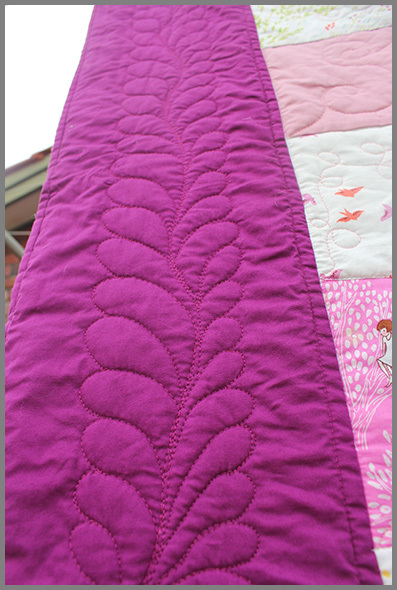 That’s my big free-motion quilting goal these days is to do a quilt with feathers.